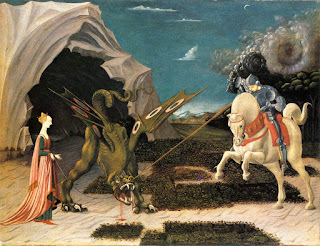 Fairy Tale Fandom: The Stuff of Legends: Saint George and the Dragon. 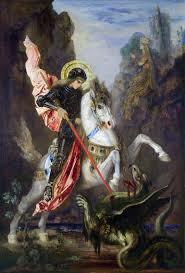 The Stuff of Legends: Saint George and the Dragon. When researching and writing about legends, sometimes you come across a figure who sort of comes at you from two directions. 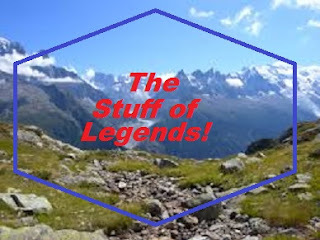 Such is the case when I decided to look into the legend of Saint George. Saint George is largely considered to be the patron saint of England. Though, a great number of other countries claim him as well. As a saint, he of course has a great deal of religious significance. However, he’s also a character who’s worked his way into more secular entertainment. He’s appeared in children’s stories by Kenneth Grahame and E. Nesit. He’s appeared in or been name-dropped in cartoons like Ben 10 and Dragon Hunters. He’s even inspired the movie Dragonslayer, though rather loosely. Who was Saint George, exactly? Well, according to the book Saint George: Hero, Martyr and Myth by Samantha Riches, no one is quite sure. However, it’s largely suspected that he was a soldier in the Roman army. His parents were supposedly Christians of a Greek background. From a religious standpoint, the most important story regarding Saint George has to do with him standing up to a pagan emperor. In some cases, it’s the emperor Dacian. In others, the emperor is named Diocletian. George had been a member of the Roman army for some time when the emperor gave an order to round up all the Christian soldiers and sacrifice every other one to the Roman gods. George naturally refused, being Christian himself. The emperor had been friends with George’s father and didn’t want to see him executed, so he tried to lure him away from Christianity with offers of land, money and slaves. George still refused. So, the emperor had to make good on his decree. George is then tortured to an astonishing degree. Across the different versions of the story, there are over twenty different tortures ascribed to the martyrdom of Saint George. He seemingly dies and is resurrected three times in the process. At one point, St. Michael the archangel intervenes and gets him freed from prison. At this point, he manages to convert many people to Christianity including the emperor’s wife. He also visits and defiles one of the Roman temples. Eventually, he’s arrested again and beheaded, thus allowing for his future canonization. After his death, his legend and cult grew. He was regarded as a military saint and “Our Lady’s Knight”, or a knight errant in service to the Virgin Mary. He supposedly appeared to Crusaders bound for the Holy Land. He’s also considered the patron saint of England, Georgia, Portugal and Malta and Gozo. Some say he even partially inspired the legend of the Knights of the Round Table. Riches even makes the case that St. George is linked to older fertility rituals meant to guarantee a good harvest and the Muslim figure of Al Khidr. So, how is it that a Christian megalomartyr can find his way into some rather secular examples of children’s literature and entertainment? Well, that would have to do with a certain encounter with a dragon. The story of Saint George and the Dragon probably came about a good while after the rest of the story. The tale says that in the city of Silene in the country of Libya, there was a body of water (some say a lake, some say a pond) that was infested with a dragon. To appease the dragon, the townsfolk would feed it sheep. When the sheep started to fail, they started to feed it their children chosen by lottery. One day, the lot falls to the king’s daughter. The king in his grief offered all his wealth and half his kingdom to the townspeople in exchange for letting his daughter go. The townspeople refuse and the princess is sent out to the lake dressed as a bride as a sacrifice. 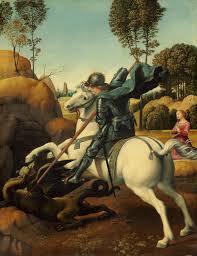 Now it so happens that saint George is riding by and sees the damsel in distress. As the princess tries to send him away, the dragon rears out of the lake. George fortifies himself with the sign of the cross and charges the beast, dealing it a grievous wound. He then asks the princess to throw him her girdle, which he puts around the beast’s neck. It now follows the princess around like a dog on a leash. They lead the dragon into the city where it terrifies the people. George then shouts that he’ll slay the beast in front of them if they agree to convert to Christianity. He ends up baptizing fifteen thousand men not counting women and children. He then slays the dragon with his sword, which is sometimes called Ascalon. 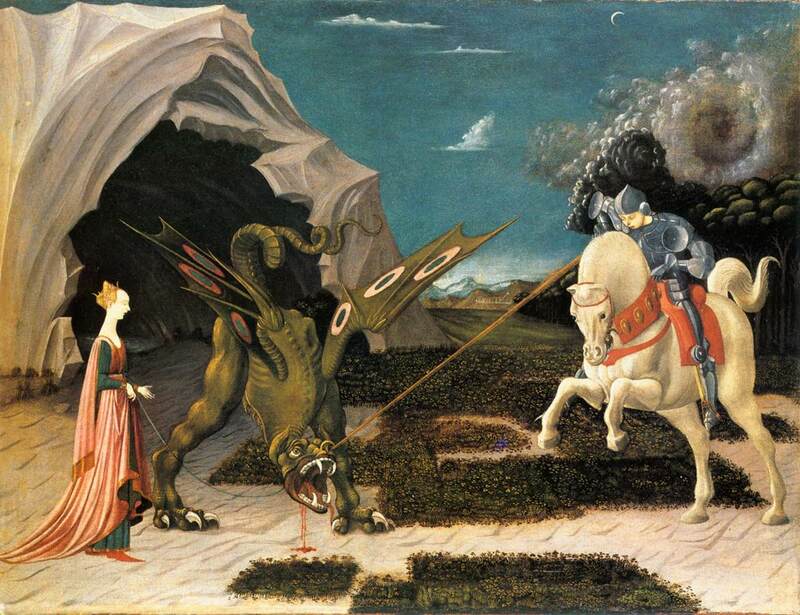 Many interpretations have been made of the legend of Saint George and the Dragon. It’s not unheard of for there to be stories of saints encountering dragons. Though, usually they’re the devil in the form of a dragon. In Saint George’s story, the dragon is usually accepted to be a dragon. Some have claimed that the dragon represents the pagan religions which were being wiped out as Christianity spread. Some say that the dragon represents lust, which must be overcome. In these cases, the dragon is usually gendered as female. Yes, as unfair as it is, in the Middle Ages lust was largely considered a female attribute. The world must have changed a fair deal to go from “lust is female” to “boys only want one thing”. The truth is that dragons can represent any number of things, and are probably worthy of a post all their own. Let’s also not forget that during the Middle Ages, people also thought dragons were a real animal. The funny thing is that all this interpretation has very little impact on Saint George’s appearances in more modern literature and popular culture. The more important thing is just the iconic image it creates. There’s a good Christian knight. There’s a princess. There’s a dragon. Can it get any more archetypal than that? The images of Saint George have probably done more to influence our image of knights and dragon slayers than any other image out there. Heck, it probably even influenced our images of Prince Charming as some sort of knight errant type. There have been alterations. In “The Reluctant Dragon” by Kenneth Grahame, both Saint George and the dragon of the story are painted as rather foppish (note: in the Disney version, Saint George is replaced with Sir Giles). In E. Nesbit’s “The Deliverers of Their Country”, Saint George is not martyred but asleep in the form of a stone carving on a tomb. I think that bit kind of recalls stories of King Arthur as “the Once and Future King” who will return to Britain someday. And in Ben 10: Ultimate Alien, the dragon is a powerful alien and George is a knight who waited thousands of years to fight him again. So, this one legendary figure has been used for a few different purposes. Some have been more solemn and religious. Others have been more fantastical and secular. However, as I’ve said before, malleability can be a good thing for a legend. Though, it’s not usually so clearly divided between two different stories about the same man. But still, this ability to appeal to different audiences in different ways does make Saint George THE STUFF OF LEGENDS! Thanks. I've been wondering about this!